On July 29th, 2015 Microsoft launched "Windows 10" with this message: Do great things. Over a years worth of work, including partnerships with brand planners, agencies, and internal teams went into creating foundational brand strategy for Windows. This section sheds light on a small portion of what went into selling the Windows brand story: Windows empowers people of action to do great things. The creative in the section was internal facing only and was used as a way to evangelize the creative strategy across the company. Microsoft launched Windows 10 on July 29th, 2015 with a single message, “do great things.” Over a year’s worth of creative brain power, including partnerships with brand planners, agencies, and internal teams went into delivering this foundational brand strategy. 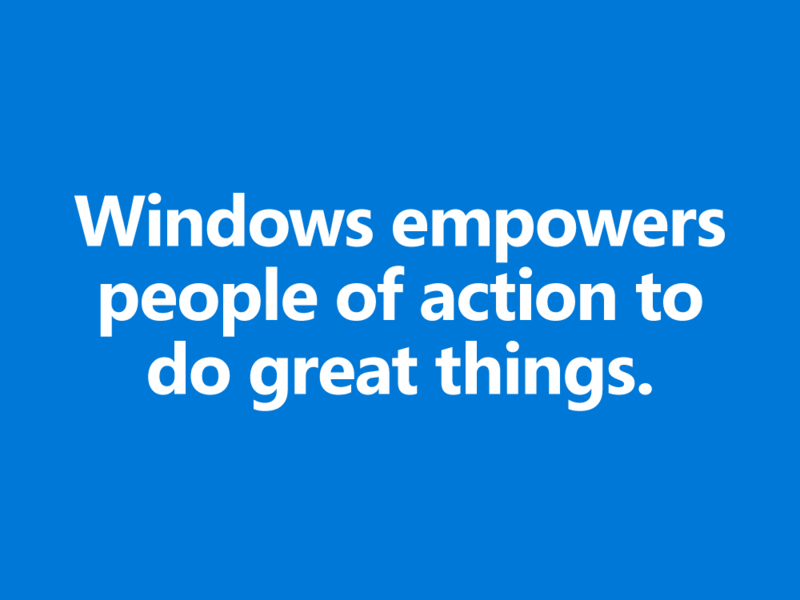 This creative was instrumental in selling this brand’s story: Windows empowers people of action to do great things. Though conceptual creative, these artifacts here were used in presentations to pitch the evolved visual tonality and messaging to external agency partners as well as the internal marketing organization.